This dolphin and whale map shows the species that either migrate to or inhabit the waters of Costa Rica. While it is impossible to guaranty you will see these species during the months outlined below, we have provided the months that they are most commonly sited in the waters of Costa Rica. 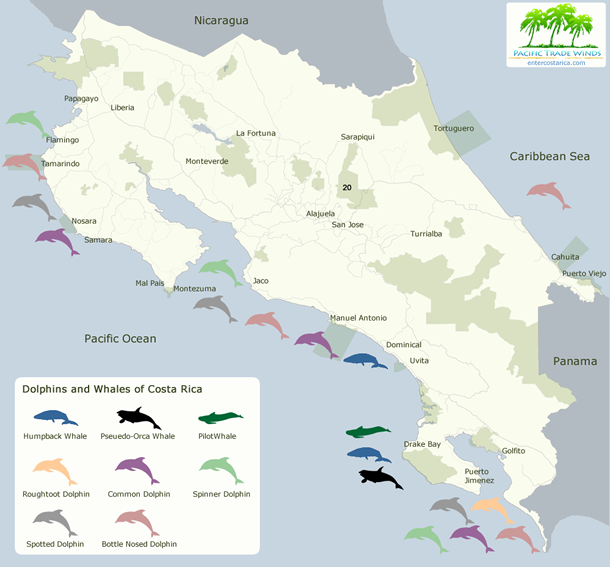 Click here to see an enlarged map or here for more information about dolphin and whale watching in Costa Rica. Humpback Whales come to Costa Rica from both the northern and southern hemispheres. The best months to observe them on the Central Pacific coast are December through March and August through October. The best months to observe them on the South Pacific coast are January through April and then again from July through October. The best months to observe Pseudo-Orca Whales are November through April. Pilot Whales can be observed off of the South Pacific coast from December through April. Roughtoot Dolphins can be observed year round off of the South Pacific coast. The best months to observe Common Dolphins are November through May on the Pacific coast. Spinner Dolphins can be observed along the Pacific coast from November through May. Spotted Dolphins can be observed year round on the Pacific coast. Bottle Nosed Dolphins can be observed year round on both the Caribbean and Pacific coasts.